Thanks to Robert Fagles, I could at last really enjoy Homer’s The Iliad! (this is a very-very late post—I finished the book on May, but due to our moving-preparations lately, I haven’t been able to write a proper review for more than two months. My memory of the book has quite faded, but I’d try to recall things which I found interesting). Now I can say that I love The Iliad! Since it is about war, some passages can be much similar. And the names… they were so much, at the end I couldn’t follow anymore, who was on which side (apart from the big heroes). Take that aside, it was a heroic story written beautifully as a poem. Often I couldn’t help reciting it when I was alone. Do you tend to take side when reading war stories? I do. From the beginning, I took side with the Trojan. I have no respect for most of Achaean top chiefs—especially Agamemnon, Achilles, and Menelaus. They were selfish and arrogant; and thinking how disputes about women could cause (or alter the course of) a war—! Menelaus is probably the worse—he’s such a cry-baby! When a man lost his wife because another man stole her, he should challenge him to duel, and end it between them. But no, Menelaus ran to his brother, and never stopped him when he decided to start the war. No, I could never take side with the Greeks! And Achilles… what a spoiled little brat he is! 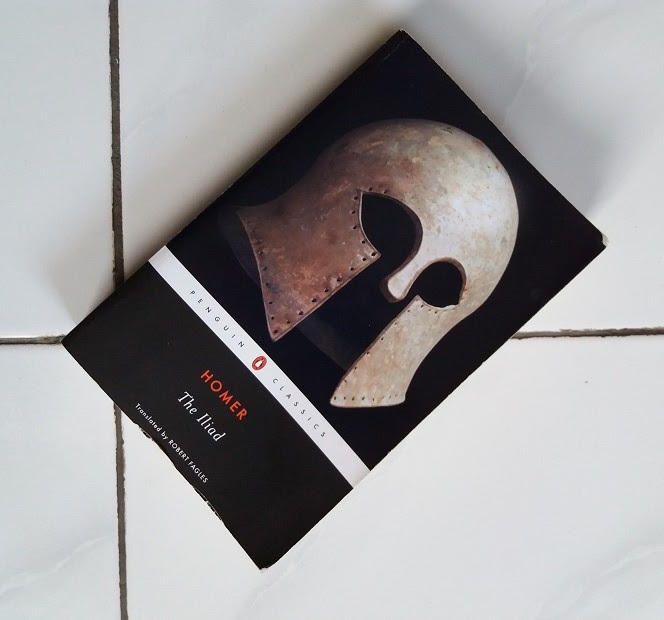 That was all that I still remember from The Iliad—definitely a worthy reading, a great epic. I still have to reread The Odyssey—which I have first read also from abridged turn-to-prose Indonesian translation—but with slightly less excitement that I have felt for The Iliad. Hopefully I am wrong!